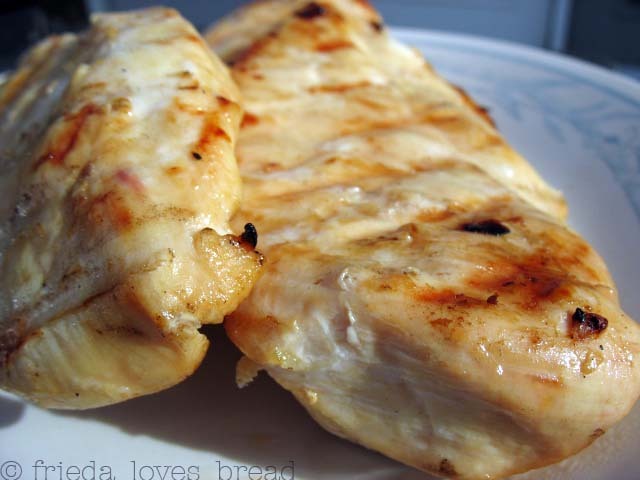 Frieda Loves Bread: Grillin' Chicken! The weather is finally warming up....it will be in the high 60's today! What is more important, is that it is not raining....as much. I love chicken and love grilling it. Chicken will dry out on the grill unless it has been marinated. 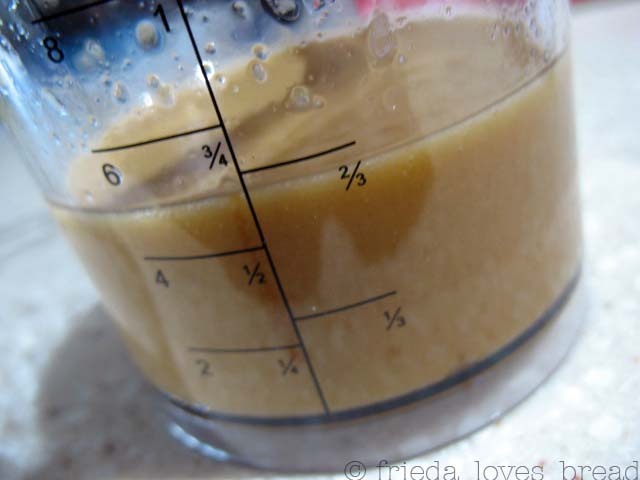 I used store bought marinades until it dawned on me that I could use a simple vinaigrette salad dressing or even better, make my own. I usually buy boneless skinless chicken that has been individually flash frozen at Costco. I was disappointed in the last two packages that I purchased of their Foster Farms chicken...there was a ton of freezer burn on the chicken. Fortunately, Costco has a great return policy ~ I decided to try their Kirkland boneless chicken. 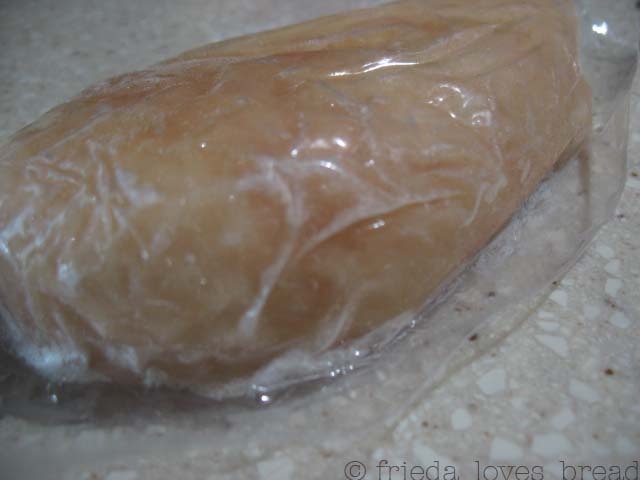 Each chicken breast is individually vacuumed sealed, reducing the risk of freezer burn! Each individual package has a stamped date....no more guessing! I put the unopened package of chicken in the microwave to thaw out. While it was thawing, I made my Asian Sesame Ginger dressing. It was a snap to make with my immersion blender! Yay! I don't have to touch raw chicken! Pour the marinade on top. 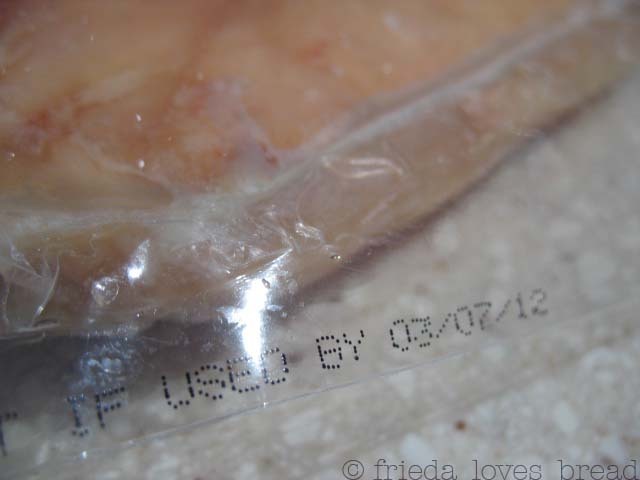 If you have a vacuum food sealer, it will only take 20 minutes to marinate; otherwise, allow 4-6 hours to marinate the chicken in a Ziploc baggie or other container in the fridge. Preheat your grill on high and scrape of any bits with a brush. Put the chicken on the grill and toss the leftover marinade. Grill the chicken on high, uncovered, for a total of 20-25 minutes, turning it over every five minutes to prevent burning. The result? A moist, flavorful chicken! It tasted great by itself and was even better the next day in a salad, with carrots, Chinese noodles and wrapped in a homemade flour tortilla. Happy Memorial Day, everyone. Enjoy your day with your families, remembering loved ones and those who fought to preserve our freedoms! I must admit, I'm no grilling expert. Anything I make on the grill comes out sub-averaqe. But the marinade notion with chicken always eludes me. Now I know that marinading stops it from drying out, but I can never get a marinade to soak really into a piece of chicken. At best, it just keeps the exterior moist on the grill. The result (for me): always bland chicken on the inside. Is this just a problem I have? Chris, I'm not sure what the problem could be. 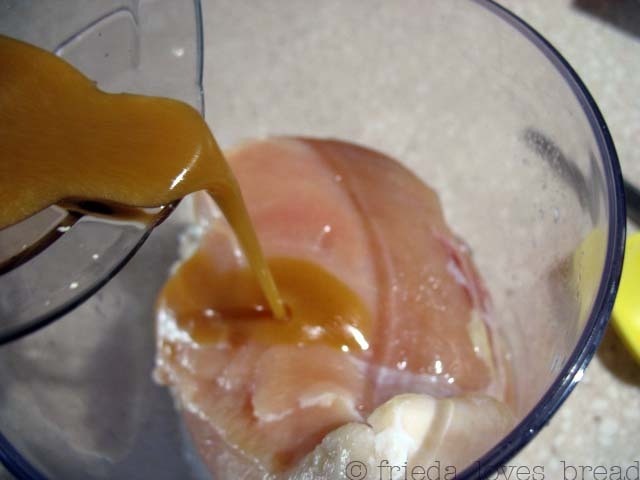 It's my understanding that a good marinade needs a vehicle of oil, vinegar, and some element of sweetness to be able to penetrate through the muscle fibers of the chicken. The time that you marinate could make a difference too, usually 8 hours or overnight will help. Ever since I bought my Food Saver 15 years ago, I've used it for marinating as the vacuum process "pulls" the muscle fibers apart and allows the marinade to soak through, allowing for more flavor and a juicier piece of meat. Plus, it only takes 20 minutes vs. overnight to marinate. Give this recipe a try and let me know how it turns out for you. And I am such a chicken on the grill kinda girl! Great tips about Costco chicken. I have felt that same way about their foster farms - lots of freezer burn. I absolutely LOVE grilled chicken! I will have to check out the Kirkland brand and get to grilling! That marinade looks easy delicious and the chicken looks perfect. We are at 98 degrees today. YIKES. Looks amazing! I love marinading chicken!